Venables Oak offers a unique service of sawn to size kiln dried European oak in both Prime grade and Character grade. This service allows you to order your exact required dimensions and not have to worry about waste, cut off's and most important of all, your time cutting the oak to size. A grading and selection process is carried out before the European oak is sawn to size. Great care and understanding is considered to ensure consistency through your order process. Please note you are entering your width and thickness in millimeters and your length in meters. 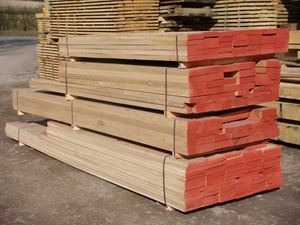 Timber may be supplied overlength to be end trimmed on site. Venables Oak offers a unique service of sawn to size kiln dried European oak in both Prime grade and Character grade. This service allows you to order your exact required dimensions and not have to worry about waste, cut off's and most important of all, your time cutting the oak to size. A grading and selection process is carried out before the European oak is sawn to size. Great care and understanding is considered to ensure consistency through your order process.